The Pit Bull Maddog Mud Terrain Radial LT, Growler All Terrain Extra Radial LT, Rocker XOR-LT Extreme Off-Road Radial. 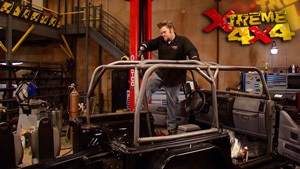 TJ Wrangler 4" PRO-LCG Suspension System with shocks. Raceline 17 x 9.5 8 lug RT231 Competition Beadlock Series Monster Black. 3.5" Wide Rear Tube Flares. GenRight Off Road "Full" Aluminum Corner Guards. Tube Fender w/ 6" Flare, Aluminum Filler Panels. 40 X 13.50 - 17 Maxxis M8090 Creepy Crawler.